Is a new kitchen gadget on your holiday wishlist? How about tools for making ice cream? Let’s look at a 1912 trade catalog illustrating some equipment for making and dispensing ice cream. V. Clad & Sons, Philadelphia, PA. Clad’s Ice Cream Machinery Tools and Utensils, 1912, front cover, Clad’s Vertical Brine Ice Cream Freezer. One of these utensils is the Ice Cream Disher used for scooping the ice cream. Two types of ice cream dishers are shown below, including the Eureka Ice Cream Disher. It required only one hand to use it and included a finger rest to help make it more stable to hold. 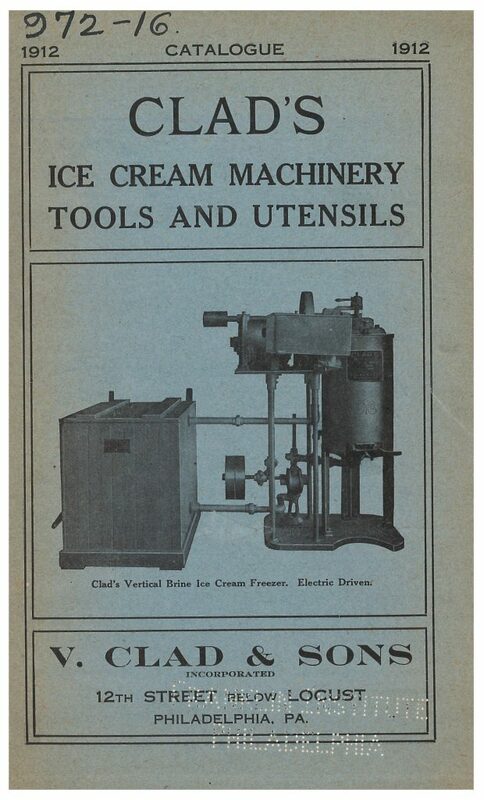 V. Clad & Sons, Philadelphia, PA. Clad’s Ice Cream Machinery Tools and Utensils, 1912, inside front cover, ice cream tools and utensils including ice cream dishers, ice cream measures, and ice cream cone filler. Another tool illustrated on the same page, above, is the Unique Cone Filler. Its purpose, as its name suggests, is to fill ice cream cones. A neat feature of this tool was, besides filling the cone with ice cream, it also helped to make the ice cream smooth and round on top. But how was the actual ice cream cone made? The batter for the ice cream cone was mixed in a machine. Illustrated below are two different types of batter mixers. The Power Batter Mixer for Ice Cream Cone Batter was rather large, covering a floor space of 48 inches by 20 inches with a capacity of 75 pounds and the ability to tilt. Then once the batter was mixed, the ice cream maker might have used the Ice Cream Cone Oven, shown below, to bake the cones on a range or stove. V. Clad & Sons, Philadelphia, PA. Clad’s Ice Cream Machinery Tools and Utensils, 1912, back cover, ice cream cone batter mixers, ice cream cone oven, and Philadelphia Milk Shake. Perhaps creator of these ice cream confections planned to take the ice cream and cones to a park or other location outside of a store. The Ice Cream Cone Carrier was a handy item for just that purpose. Made of retinned steel wire, it had slots for holding 24 ice cream cones and included a handle for convenience. 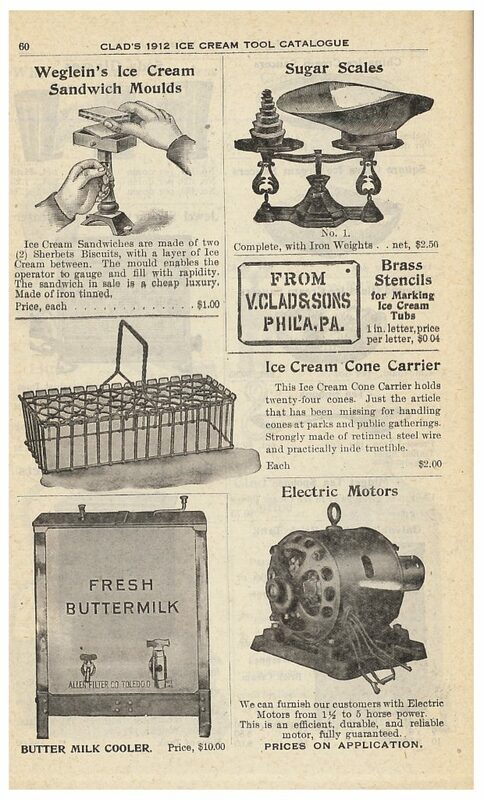 V. Clad & Sons, Philadelphia, PA. Clad’s Ice Cream Machinery Tools and Utensils, 1912, page 60, ice cream sandwich moulds, sugar scales, ice cream cone carrier, butter milk cooler, and electric motors. 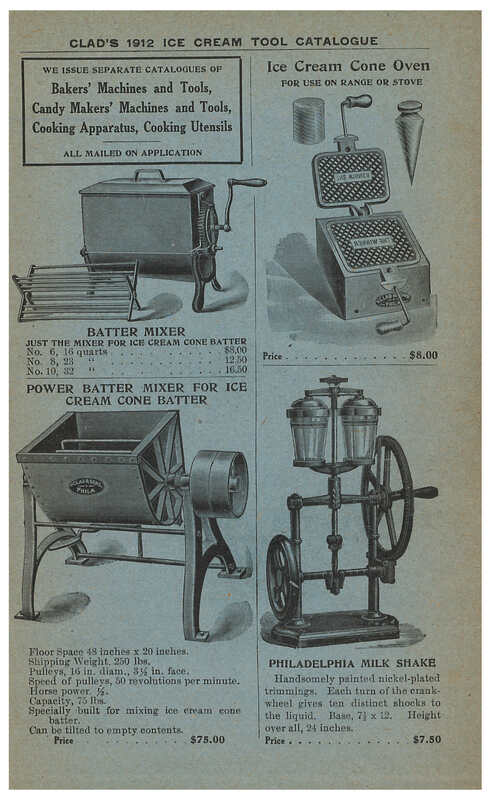 These are just some examples of the ice cream equipment shown in Clad’s Ice Cream Machinery Tools and Utensils (1912). 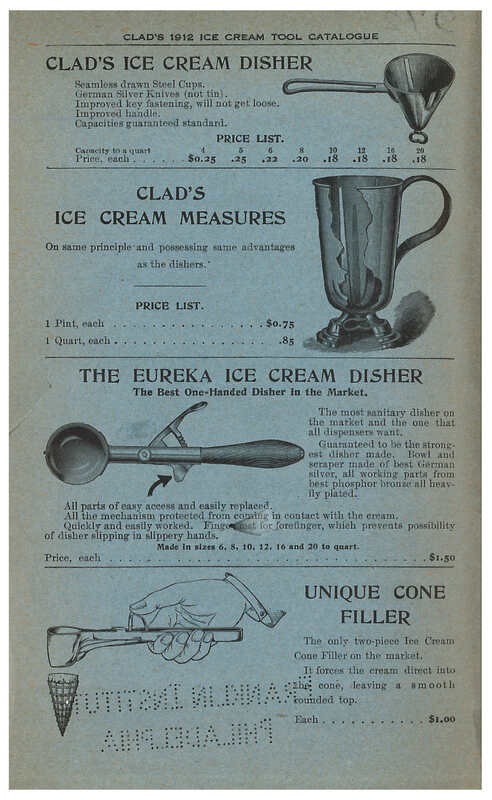 This catalog and others related to making ice cream are located in the Trade Literature Collection at the National Museum of American History Library. Interested in more ice cream related items from the past? Check out these posts about ice cream freezers, hand-folded ice cream boxes, and soda fountains.